Today Catholic Cuisine will be hosting its first From Thy Bounty Fair, with the theme of First Holy Communions. I am so excited to see all the posts, especially since our oldest will be receiving his First Holy Communion on the 31st of this month, at his Godfather's very First Mass! We have been busy preparing. 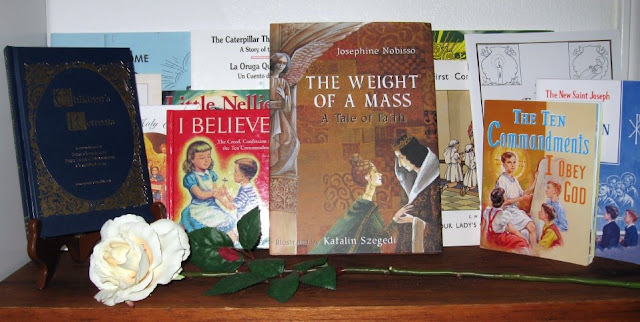 In addition to his learning his catechism, we have been reading various First Communion Reflections of the Saints, as well as many wonderful books to further prepare him for this great Sacrament. Now, since we will be traveling for this special day, we will be celebrating Fathers First Mass and Captains First Communion by going out for brunch! I hope to pick up a prepared cake, and add a few special touches. In A Continual Feast: A Cookbook to Celebrate the Joys of Family and Faith Throughout the Christian Year the author recommends a Decorated Sheet Cake. You can also prepare for a first communion or confirmation a large flat white cake (or any kind of cake), with a white icing. It can be decorated in any of the following ways (among others). With the words "Happy (or Blessed) First Communion (or Confirmation), " plus the child's name. Oh! One last thing. If you have a First Communicant, a lovely way to wrap up their preparation, would be with a Novena! Margaret posted a beautiful one which Captain will be saying the nine days before his First Communion. UPDATE: Margaret has created a printable you can download here. Please remember to keep Captain in your prayers, as well as his Godfather who will be ordained a priest the day before, by His Eminence Dario Cardinal Castrillon Hoyos. In fact, from what I hear, the ordination will be broadcast live on EWTN, Friday, May 30th at 10:00 am! I love Thee in the Most Blessed Sacrament." "My God, I believe, I adore, I hope and I love Thee. do not adore, do not hope, and do not love Thee." I pray you and your family will have a wonderful celebration. What an exciting time for you. You have prepared him well. This is just beautiful Jessica, your little sweeties are so blessed! Praying for your First Communicant, it will be so special! Wow, you did so much to organize all of this. My son made his First Holy Communion 3 1/2 wks ago, my camera broke that day...so no pictures or anything to add to the already wonderful things on your blog and on Catholic Cuisine!! I will remember to come here when preparing my daughter in 2 years! Welcome back, I missed you!! Thank you so much for contributing your posts to the fair, Jessica. This is agreat resource for anyone preparing a child for First Communion. This is just so detailed and a wonderful resource. Thank you so much! How funny that we both shared Vitz's ideas! I missed this post somehow? There are so many wonderfui ideas and links here! It will be several years before we have another First Communion, but you have given me so many ideas! I am so happy your kids have you as a Mother! God Bless you and have a great trip.